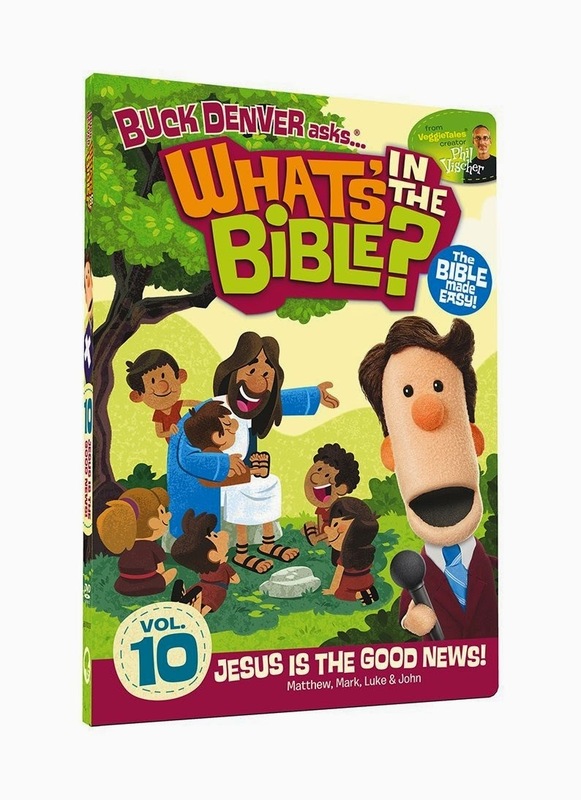 Host Buck Denver and his friends make understanding the Bible easy as they take your family through the stories in What's in the Bible? Volume 10: Jesus is the Good News! Explore the 400 years between the Old and New Testaments, and then learn about the life and ministry of Jesus Christ from the books of Matthew, Mark, Luke and John. This volume also shares the Gospel and encourages children (and parents) who don’t know Jesus to do so - and to reach out to a friend or Pastor to experience God’s saving grace. Sounds pretty great right? It gets better. Remember how I said my son was a big Veggie Tales fan? I was excited to see that creator Phil Vischer created this wonderful series as well. So, it had some of that same great humor...and of course the fun music that we loved from Veggie Tales! Awesome! But where Veggie Tales is very silly and seems to focus more on the moral of the story rather than the historical accuracy, What's in the Bible truly delves into the details of the bible and aims to teach children and help them understand the specifics...and it does so wonderfully! We still have the fun- puppets and cartoons, fun characters (like pirates, cowboys and news anchors) and songs, and yes even some silliness, but at its core it remains educational. Still, with the fun added in, it makes learning about the bible FUN! My son appreciates this much more than me sitting down and merely preaching at him, right? This particular volume even makes a Star Wars reference...a definite plus in my son's eyes! Let's be honest, the Bible can be quite difficult to understand at times...even for adults! So for kids, it can be particularly tricky! This DVD series breaks it down in a way that is both entertaining and easy to understand- but again in a way that truly teaches, even as an adult that grew up in Sunday School, I feel like I learned from it! This particular volume is an introduction to the New Testament and the importance of Jesus. Now, as a child, I remembered learning about these stories and the messages, but I honestly didn't understand much of it at all... what did it all mean? how did it pertain to ME? I just couldn't make sense of it. The ideas of repentance and forgiveness can be hard concepts for adults to wrap their heads around, let alone children. I honestly feel that would this series been around when I was a child, it would have helped me to make a lot more sense of it all. I am glad that as a mom, I can share it with my child and feel confident that he is not only being entertained, but educated as well. Whether you are a Sunday School teacher looking for a teaching aid for your students, or a mother like myself who wants to help her children grow in Christ, this is a fantastic option worth looking into. You can purchase this volume as well as the others from Family Christian. We will certainly be purchasing more ourselves!! Do you have a child in your life who would enjoy these DVDs? Which DVD do you most look forward to watching? What other ways have you found to teach your children about the Bible? Disclosure: I received a free download of the episode mentioned in this post in exchange for my review. All thoughts are 100% my own. Post contains affiliate links...which means if you click and purchase these DVDs or any product from Family Christian, I will receive a small commission. This sounds so awesome. I'm bookmarking it for the future -- I love the concept and I love Veggietales, so anything made by the same creator sounds great!